This Soho pub, located not far from Piccadilly Circus, takes its name from the blue posts which once stood out front. A pub is believed to have stood on this site at 28 Rupert Street – now in Chinatown – since at least 1739 and is believed to have been updated substantially in about 1850. While the blue posts themselves are long gone, the building itself is now painted blue. 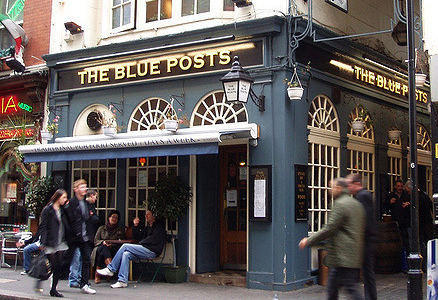 It has been suggested that the blue posts were simply placed out the front to mark the pub’s location before street numbering systems were introduced – as in, “it’s the place with the blue posts out the front”, but there are a number of other suggestions for the origins of the name. One is that the blue posts were used as border markers for the royal hunting ground which once stood or Soho. Another, perhaps more likely than the aforementioned, that they marked locations where you could hire sedan chairs from in times gone by. Whatever the reason for its name, this small, Grade II-listed pub, which is located on the corner with Rupert Close, underwent a complete transformation in early 2018 by the team behind the Israeli eatery, The Palomar. As well as a small pub in ground floor of the building, it also boasts a cocktail lounge on the upper floor called the Mulwray (apparently named for the character, Evelyn Mulwray, played by Faye Dunaway in the movie Chinatown) and a small restaurant in the cellar called Evelyn’s Table (another Chinatown reference). The Rupert Street establishment is one of several pubs with the same name in West End – others include one located nearby in Berwick Street, another in Newman Street, and yet another in Bennet Street in St James’s. And that’s just those in near proximity. So whatever the blue posts represented, it was clearly a relatively common feature in the area.